For anyone who sits in meetings or class and needs to draw diagrams, figure numbers, write down dates, or note assignments and needs paper and pen to do it, Booq has produced a beautiful new iPad 2 case called the Agenda. Our iPads are wonderful. I can’t live without mine, and I take it to meetings all the time. But frequently I find myself reaching into my purse for a pad of paper to write something down to hand to someone else. We still need paper. This Booq case comes in four distinct colors and designs. There is a black leatherette exterior with gray interior, a coffee Nappa leather exterior with cream interior, a gray recycled PET* exterior with green interior, and a sand recycled PET exterior with plum interior. The MSRP for the leather version is US$99.95. The MSRP for others is US$49.95 although I found some a bit cheaper on Amazon. The pad of paper is 50-sheet A5 size, made from 30 percent post-consumer materials and printed with soy ink, a surface the designers say makes for an easy writing surface. Additional notepads are available in 3-packs designed with no lines, with lines, special design for developing websites, etc. The 3-packs are US$9.95 from the company website. The inside of the case has large cutouts in the center crease for a pen and there are pockets for business cards and notes. There is a sturdy flap to hold the iPad 2 securely in place and a snap closure on the outside to hold the case closed when not in use. Perhaps the most important element to this case is that it works perfectly for both right and left hand users. There are port holes and cutouts for the on button in both ends. The pad of paper can be switched to suit the handedness of the user as well. I asked a left-handed friend to use the case for a couple of hours while we were in a meeting, and he was delighted with it. The pad of paper is big enough that one can actually work on it. The writing surface is 7.5 x 6-in. I have the sand color with the plum interior. The exterior looks like linen and the dark plum interior is yummy. Even though the exterior is a light color, it seems to resist soil, fingerprints, etc. I do. This is a very good case. Well designed and well made. It looks good too. The addition of the pads of paper and the pen slot may be important to many users, and certainly the comfort factor for left-handed users is an important issue as well. * 100% recycled PET, the material used to make water bottles. 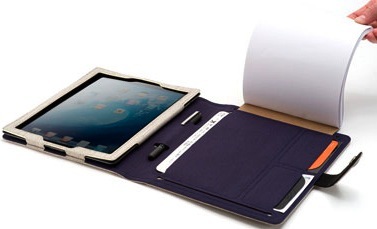 Well made, attractive case includes paper pads for note taking.